the US) so the whole universe is abuzz (yeah, that’s a word!) with theories about what the hell is going on. I have some theories involving John Locke being the Devil but that’s just me. If you want to see a teaser of season two go to the Oceanic Air website and use the magic numbers to see it (hint: 4 8 15 16 23 42). I have made a gallery of ultrasounds just in case anyone ever wonders what Kristie looks like from the inside. Had the 21 week ultrasound last night……It’s a boy! I haven’t played an actual game on my xbox for about a year. I have it networked to my PC and use it to stream media content from there (music, video, pictures etc), it looks like Microsoft has finally caught up with the rest of the world and is offering a “legal” (i.e. without having to mod your xbox) way to do this via their Media Center Extender for Xbox. Universal Remote. Most likely sold seperately but the specs say this is a universal learning remote that lets you program in the functions of all your other home theatre equipment. Wireless controller that also supports the headset, wirelessly….wirelessly! Progessive scan DVD player out of the box..given past history the DVD players in consoles have sucked but I suspect that since Microsoft wants to replace all your other hi-fi gear with theirs that the XBOX 360 may do a better job of this..we’ll see. As mentioned above, out of the box the XBOX 360 has all the functionality of the current XBOX Media Centre (which you can only run if you have a modded xbox)..which is great! Found this through metafilter and it’s an amazing piece of art drawn completely in MSPaint. It got me to thinking back when Ian and I spend many many many hours reproducing album covers in MSPaint, my favourite was Def Leppard’s Hysteria and I think Ian did a great one of R.E.M.’s Out Of Time. Of course, I remember them being amazing works of art but they will most likely look like crap in the cold light of 2005. I’ll dig thorugh my ancient CD backups and post them here if I can find them. 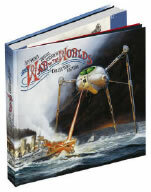 SonyBMG are set to re-release the award-winning Jeff Wayne’s Musical Version of The War of The Worlds in June. The highly anticipated classic album will now be available in two formats, the original double album and a definitive 7-disc collector’s edition package which are both re-issued on double hybrid SA-CD with 5.1 surround sound and stereo re-mastered mixes. This set sounds (looks?) amazing, featuring a completely remastered version of the musical on 2 SACD’s (luckily my DVD player can play SACD) and 5 more discs of extras (including a DVD with making of..type stuff) and a fancy booklet. I haven’t listened to War of the Worlds for a while, time to set aside a couple of hours in June! I made a picture gallery using Photoshop CS2, it’s nifty! houseboat sailing (motoring?) down the Murray from Mildura (and almost to Wentworth). read books without lots of pictures these days) I will give a mini review of each book. biology and backstory which is probably why it never made it to the screen. gazing and far too intricate explainations of reasons for superior officer’s actions. This was recommended by Michael who also told me to read Starshit Poopers so I was a bit worried. which I’m sure to read some time in the next 20 years. helicopter (or was it a jet) and survives! his life and the creation of his blog. I did more than read, I took lots of photos and gave the new video camera a work out too so I’ll post some pictures when I’ve sorted through them all. You scored 85% Beginner, 100% Intermediate, 93% Advanced, and 80% Expert! You did so extremely well, even I can’t find a word to describe your excellence! You have the uncommon intelligence necessary to understand things that most people don’t. You have an extensive vocabulary, and you’re not afraid to use it properly! Way to go!Thank you so much for taking my test. I hope you enjoyed it!